Welcome to the wonderful week of recipe make overs! I love this week because it’s a great way for this great group of bloggers to share healthier versions of some favorite recipes! Today I am sharing this delicious one of my family favorites! 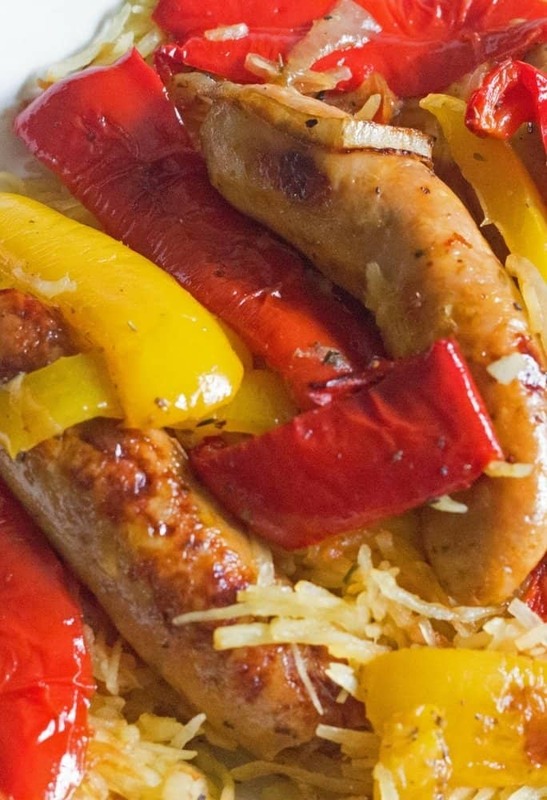 We love sausage and peppers over linguine. I made a few minor changes to make it a healthier. Trust me, my friends, this is epic! I swapped out pork sausage for chicken sausage. Right there that’s a huge calorie savings. Then, I used spaghetti squash instead of linguine! My boys, the carnivores, love it! They do not miss the carbs either! As you all know, I love to cook and hate the clean-up, so this recipe is the bomb because it has it all! 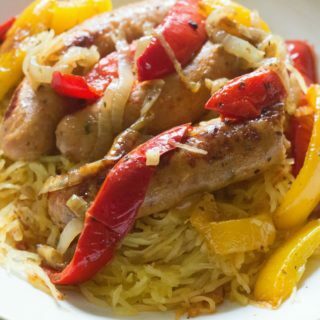 Chicken sausage with spaghetti squash has become a regular in our dinner rotation. Feel free to substitute spicy chicken or turkey sausage, both great variations to this recipe! I hope you make this one ! I’d love to hear how you enjoyed the recipe! Let me know here by leaving a comment! Share your pictures of any of my recipes on Instagram! Use #everydayeileen and I love to see and share your photos on Instagram!! 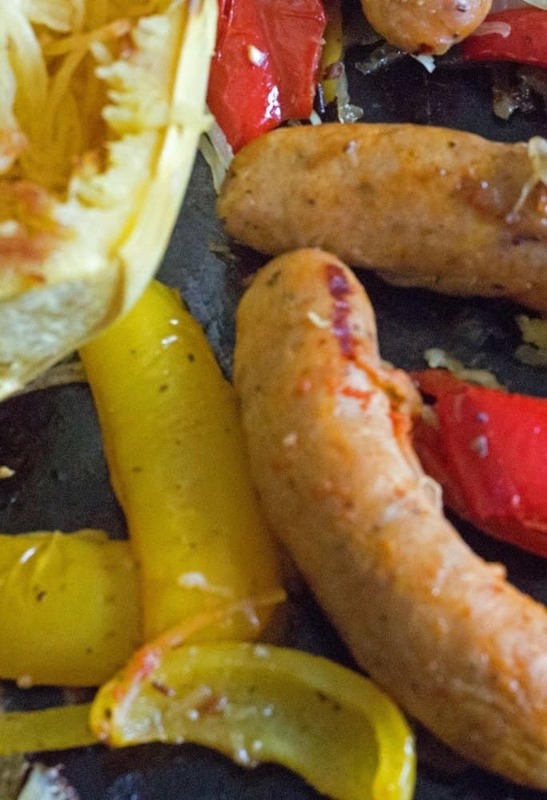 Save this Chicken Sausage recipe to your FAVORITE PINTEREST BOARDS! I hope you follow me on PINTEREST! I’m always pinning from talented and amazing bloggers! If you like this recipe, please like and share it on Facebook ! Please continue connecting with me on other social medias, Twitter, Bloglovin, Google Plus ! 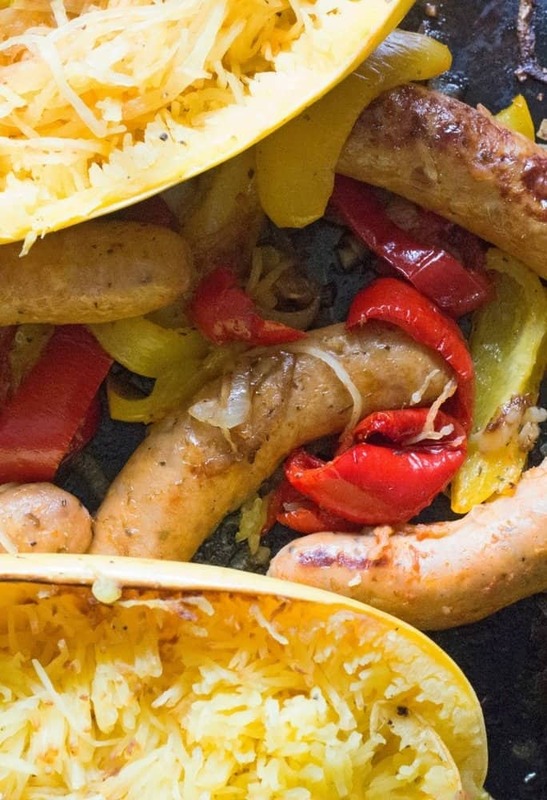 A healthy and delicious sheet pan meal Using chicken sausage, peppers, onion, and spaghetti squash in lieu of pasta. A low-carb, low-calorie, gluten-free, one sheet pan, easy meal! Slice the spaghetti squash in half, remove and discard the pulp and seeds. Brush the flesh of the spaghetti squash lightly with a small amount of olive oil. Then season to taste, with salt and black pepper. In a large bowl, combine the onion, red pepper, yellow pepper, olive oil, garlic, dried Italian seasoning. Add salt and black pepper to taste. After cooking the spaghetti squash for 15 minutes, remove the sheet pan from the oven. Add the seasoned peppers, onions, and chicken sausage. Return to the oven. Bake and set timer for 10 minutes. After the 10 minutes. turn the sausages, peppers and onions. Cook or another 15 minutes. Sausages should be at 165 degrees. Once cooked, remove the sheet pan from the oven. Use a fork to flake all the spaghetti squash. It will resemble spaghetti. Assemble either in individual plates or one large platter. 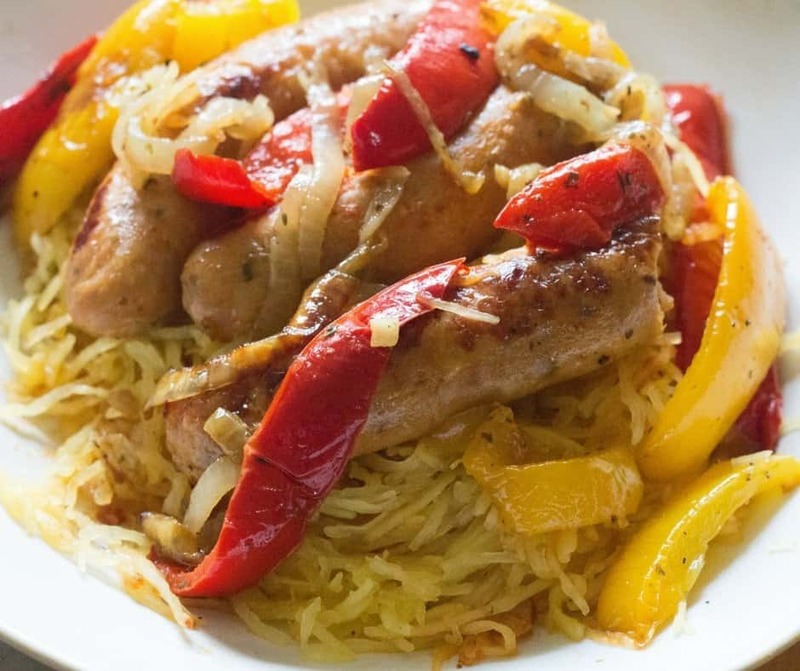 Top the spaghetti squash with marinara sauce, sausage, peppers and onions. Sprinkle with Parmesan Reggiano Cheese. any nutritional data I provide is an approximation and actually dietary information can vary based on ingredients and proportion sizes. Sizes of spaghetti squash will vary, please keep that in mind when you are first roasting. If cooking a very large squash, give a little more time to the first set of cooking. feel free to vary sausage to hot chicken sausage or any type of turkey sausage. We love sheet pan meals. This was an easy and tasty meal. Thanks for the recipe. Yum! This looks so delicious + filling! I need to go get some spaghetti squash! Saving this idea for the next spaghetti squash we get from the CSA. Mmmm! That’s awesome Audrey! I hope you enjoy the recipe! Awesome, I hope you enjoy! Let me know when you make the recipe! I would love to hear how it worked for you! Now this sounds like my kind of dinner!!! Thank you Wendy! Its absolutely delicious! I hope you enjoy!